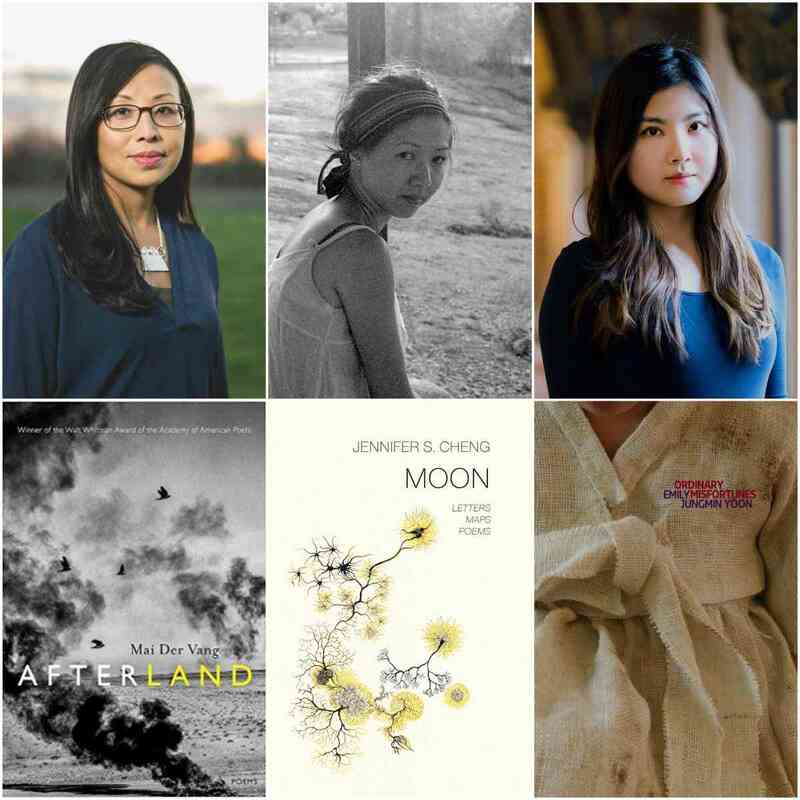 Join us for the poetry readings with Jennifer Cheng, Mai Der Vang, and Emily Jungmin Yoon. A Q&A and signing will follow the discussion. About Mai Der Vang: Mai Der Vang is the author of Afterland (Graywolf Press, 2017), winner of the 2016 Walt Whitman Award from the Academy of American Poets, longlisted for the 2017 National Book Award in Poetry, and a finalist for the 2018 Kate Tufts Discovery Award. She is the recipient of a Lannan Literary Fellowship and currently serves as a Visiting Writer at the School of the Art Institute of Chicago. Her poetry has appeared in Poetry, Virginia Quarterly Review, LA Review of Books, Guernica, among other outlets and anthologies. Her essays have been published in the New York Times, the Washington Post, and elsewhere. Mai Der is a member of the Hmong American Writers’ Circle where she helped co-edit How Do I Begin: A Hmong American Literary Anthology. As a Kundiman fellow, Mai Der has completed residencies at Civitella Ranieri and Hedgebrook. Born and raised in Fresno, California, she earned degrees from the University of California Berkeley and Columbia University. About Moon: Letters, Maps, Poems: Mixing fable and fact, extraordinary and ordinary, Jennifer S. Cheng’s hybrid collection, MOON: Letters, Maps, Poems, explores the ‘feminine monstrous’ as it draws on various Chinese mythologies about women, particularly that of Chang’E (the Lady in the Moon), uncovering the shadow stories of our myths — with the belief that there is always an underbelly. MOON explores bewilderment and shelter, destruction and construction, unthreading as it rethreads, shedding as it collects. About Jennifer S. Cheng: Jennifer S. Cheng writes poetry and lyric essay. Her debut book, HOUSE A, was selected by Claudia Rankine as winner of the Omnidawn Poetry Book Prize, and she is the author of the forthcoming hybrid collection MOON: Letters, Maps, Poems, selected by Bhanu Kapil as winner of the Tarpaulin Sky Book Prize, and Invocation: an Essay, an image-text chapbook published by New Michigan Press. Her writing appears in Tin House, Conjunctions, AGNI, The Literary Hub, Black Warrior Review, DIAGRAM, The Normal School, Guernica, Hong Kong 20/20 (a PEN HK anthology), and elsewhere. She was a Fulbright Scholar and received fellowships and awards from Brown University, the University of Iowa, San Francisco State University, Bread Loaf, Kundiman, and the Academy of American Poets. Having grown up in Texas, Connecticut, and Hong Kong, she lives in San Francisco. About Ordinary Misfortunes: Korea continues to grapple with the shared memory of its Japanese and US occupations. The poems in Ordinary Misfortunes incorporate actual testimony about cruelty against vulnerable bodies—including the wianbu, euphemistically known as “comfort women”—as the poet seeks to find places where brutality is overcome through true human connections. About Emily Jungmin Yoon: Emily Jungmin Yoon is the author of Ordinary Misfortunes, the 2017 winner of the Sunken Garden Chapbook Prize by Tupelo Press and selected by Maggie Smith, and A Cruelty Special to Our Species, forthcoming from Ecco Books in September 2018. She is represented by Jin Auh at the Wylie Agency. Her poems and translations have appeared or are forthcoming in The New Yorker, POETRY, The New York Times Magazine, Korean Literature Now, and elsewhere. She currently serves as the Poetry Editor for The Margins, the literary magazine of the Asian American Writers’ Workshop, and is a PhD student studying Korean literature in the Department of East Asian Languages and Civilizations at the University of Chicago.